So it’s come to this. It isn’t enough to use past juvenile tweets as a means to shame and subordinate professional athletes. Now the sportswriting establishment is lobbying for teams to exercise control over their social media conduct and style even when no slurs or even alleged slurs are involved. Trevor Bauer is an established major league starting pitcher for the Cleveland Indians, finally emerging a s star after many years of dreaded “potential.” He’s not a kid–he’s 27—but in his public dealings and image be appears to be about 14. There’s nothing wrong with that at all. He plays a kid’s game, and young sportswriters cheer players now who make faces, preen, trash talk and engage in extreme on-the-field celebrations. Dignity on the field is considered passe, a problem for baseball. Be out there! Show personality! Ah, but some sportswriters have decided that they are the arbiters of what kind of eccentricities are acceptable, even off the field. For some reason, sports media like NBC Sports and ESPN have decided to pollute sports reporting with the unqualified declarations of woke and aspiring social justice warriors. I know not why, unless it is part of the full immersion progressive indoctrination strategy that the news media has joined. At NBC Sports, two baseball writers, Bill Baer and Craig Calcaterra, are such devoted leftist propagandists that any regular reader can predict their screeds before reading them. If the baseball page isn’t just lifting news unaccredited from other sites (MLB Trade Rumors, diligent, competent, and blissfully politics free, is the main victim), Baer or Calcaterra are making arguments that Rep. Oacsio-Cortez would endorse in a heartbeat. For example, they believe that it is travesty of justice that team owners aren’t willing to pay millionaire players what the players feel they “deserve” rather than what is prudent for the owners’ budgets and what makes sense based on reasonable assessments of a players’ value. Indians pitcher Trevor Bauer is what we extremely online people call “extremely online” [which means] to inculcate oneself to Internet culture, including humor. Bauer exemplified this last year when he went to arbitration with the Indians. He wanted to file for $6.9 million, but …the right-hander was warned that the figure was too high and could result in him losing his case. He then wanted to file for $6,420,969.69. Why 69? As any teenager can tell you, it references a sexual position and that’s funny stuff on the Internet. Why 420? Well, that references April 20, or 4/20, a day of celebration for marijuana enthusiasts…Bauer started “The 69 Days of Giving” in which he would donate $420.69 daily to a different charity. On the 69th and final day, he pledged to donate $69,420.69 to a secret charity. So, that gives you a bit of a picture of Bauer’s personality and sense of humor. .
…Why is Bauer’s behavior wrong? Simply put, it’s because there’s a power imbalance and Bauer exploited that to harass a woman, a baseball fan. Even after the online fracas with Bauer, Nikki has only 600 followers. Only a handful of people would go to bat for Nikki, but even a tiny percentage of Bauer’s 134,000 followers going after Nikki constitutes a gross amount of abuse. Let’s say that only 0.5 percent got involved. That’s still 670 people — more than Nikki’s entire follower count. It’s tough to get an actual count of just how many people were in Nikki’s mentions as a result of her interactions with Bauer, but a cursory search shows it’s quite a lot. In short, Bauer wielded his power – his fame and online influence – improperly and unfairly towards Nikki. He bullied her. It is also notable that Bauer chose to obsess this way over a female critic. He has never gone to this length to challenge a male critic. Now that Bauer has gone Full Social Justice #MeToo Virtue-Signaling Avenger, let’s unpack this. What does Jackie Robinson’s autobiography have to do with Colin Kaepernick, you ask? Well…nothing at all, really. Over at the NBC Sports website, Craig Calcaterra is an over-qualified baseball pundit who chose to blog about the sport he loves rather than practice law. Good for him; I admire his choice, and always will. Unfortunately, as I suppose could have been predicted, Craig now appears to be getting bored with writing about baseball and increasingly ventures into social and political commentary, at which he is strikingly biased and incompetent. His latest effort, which given its subject matter has gleaned more publicity and links that any of his many, many astute posts about what he is supposed to be writing about, is best described as pundit malpractice. It also represents a rationalization for unethical conduct that is not currently represented on the Ethics Alarms Rationalization List. 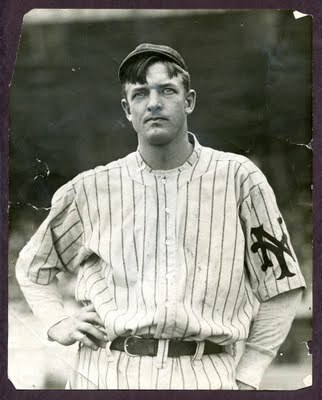 Christy Mathewson, a genuine hero. Barry Bonds would have made him want to throw up. I like and admire Craig Calcaterra, who blogs entertainingly and perceptively about baseball on the NBC Sports website. I suppose I’m a bit jealous of him too: he’s a lawyer who now earns his living blogging about something he loves. No, Craig, this is what someone failed to tell you: cheaters in any profession are not “great” by definition. Great baseball players, like great lawyers, writers, doctors, scientists and Presidents, bring honor on their profession, don’t corrupt everyone around them, don’t force people who admire them to embrace unethical conduct and turn them into aiders and abetters, and accomplish their great achievements while obeying the law, following the rules, and serving as role models for everyone who follows them. Barry Bonds was not a great baseball player. He had the ability to be one, but not the character. Hank Aaron, Willie Mays, Sandy Koufax and Tom Seaver never once disgraced their game while they wore a uniform, and indeed made baseball stronger and better while they played. Good choices all. The disgrace is that San Francisco fans voted Bonds as one of that team’s “Franchise Four,” dishonoring great Giants of the past like Juan Marichal, as well as New York Giants greats like Christy Mathewson, Bill Terry, Carl Hubbell, and Mel Ott, Hall of Famers and lifetime Giants who played with honesty and sportsmanship. But Giants fans warped values are among the casualties of Bonds’ career…and one more reason he can’t be rated anything but a great villain.